In the 1920’s and 30’s, scientists discovered that liquid crystal molecules sandwiched in a thin film between two plates changed their alignment when a magnetic field was applied. However, it was not until after the Second World War when small, low power electronic devices became available that there was a need for a compatible, compact display technology and liquid-crystal displays (LCDs) became a candidate. 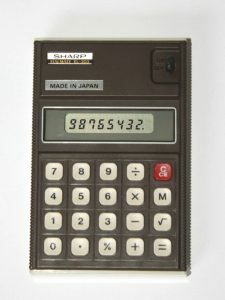 In the 1960s various compounds were tried with little success and it became apparent that there was no stable liquid crystal available and LCDs were acquiring poor reputation for reliability. 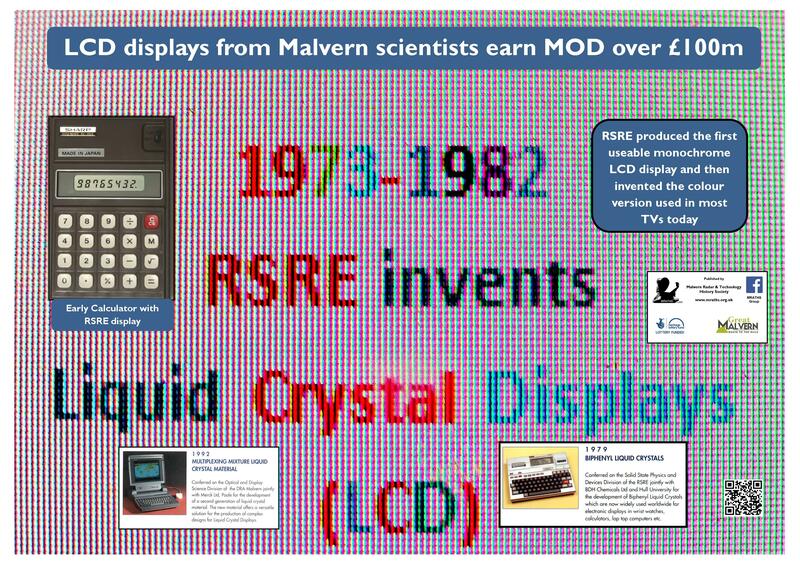 The UK had played little part in LCD development, although much UK semiconductor research had been carried out in government defence establishments and early development of LEDs (light-emitting diodes) and diode lasers had taken place in the Services Electronics Research Laboratory (SERL) at Baldock (later to be merged with RRE) and RRE Malvern. Now events took a curious turn because a politician became involved. When the Labour government was elected in March 1966 they had promised to forge a “white hot technological revolution” and the next year they established the Ministry of Technology, headed up by Tony Benn. A number of defence laboratories including SERL and RRE were subsequently placed in this Ministry. In March 1967, the Minister of State for Technology, John Stonehouse, came to Malvern. He was surprised to hear that royalties to RCA for Cathode Ray Tubes (CRT) cost the UK more than Concorde. He authorised the director of RRE, Dr (later Sir) George McFarlane to start a program on flat panel electronic displays. Surprised at this rapid decision, McFarlane set up a Working Party under one of the RRE senior scientists, Dr Cyril Hilsum, to study the field. This recommended, in December 1969, that the UK government should fund research on flat panel electronic displays with liquid crystals as their first priority. 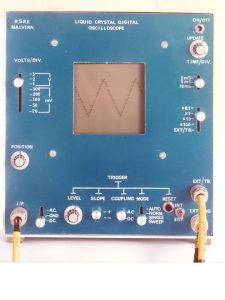 Though formal approval of the recommendation would normally have taken some months, and indeed was never granted, RRE had anticipated approval and justified its actions by the urgent need for thin, low power displays for the portable radar sets it had invented and for portable laboratory instruments such as oscilloscopes. A Display Group under Hilsum was established, and initiated both internal research and external contracts. Dr John Kirton was charged with setting up the Displays Group and, led by Hilsum, a research consortium was also established, involving RRE, SERL, Hull University and several companies. After a few years the consortium split into two, one for materials and one for devices. Hull University, led by Professor George Gray, was chosen as the clear UK leader in the understanding of liquid-crystal chemistry. Hull’s capability was needed because no stable liquid crystal materials had been made at the time and few worked at room temperature. The research progressed slowly at first, with Hull trying many novel compositions, but all were failures. 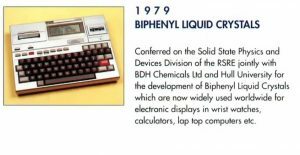 However, in 1972 it invented a completely new family of liquid crystals, the cyanobiphenyls, which showed both environmental and operational stability. There was still the need for the material to work over a practical temperature range, and this was very difficult. The solution came from a young scientist, Dr Peter Raynes, working in the RRE Displays Group, who deduced a method of predicting the working temperature range of a complex liquid-crystal mixture. Following his theory, in 1974 he made a liquid-crystal composition called E7 which in almost all respects met the specifications put to RRE by manufacturers of watch displays. It could be said that E7 was the saviour of the liquid-crystal industry, for it was invented at the time when nobody could see a way forward for LCDs. It remained the preferred material for many years and is still used in many devices. RRE decided on a restricted licensing strategy for E7 and originally only BDH and Hoffman-La Roche could sell the compound. Rapidly BDH dominated the market, and had been taken over by the German firm Merck in 1973. 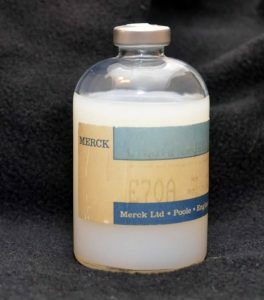 By 1977 it was the largest manufacturer of liquid crystals in the world; E7 had become its largest selling product. 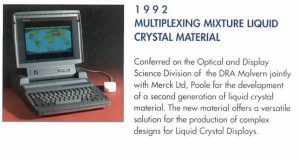 Less than five years earlier, the company had never made a liquid-crystal material. The visual appearance of LCDs depends strongly on the angle of view and both the viewing angle and contrast ratio came under criticism as the possibility of major markets became apparent. Another challenge was that the electrode sharing technique, known as multiplexing, did not work well for liquid-crystals and therefore the likelihood of their use in a wide variety of more complex devices, such as computer monitors and TV displays, was not very likely. The now Royal Signals and Radar Establishment (RSRE) Display Group had been working for some time on technology to overcome the multiplexing problem. It, and all world centres working on flat-panel displays, had tried many methods, and was alert to new possibilities. The first breakthrough at Malvern was Dr Ian Shanks’ invention of a novel multiplex addressing scheme which worked well for certain limited types of displays, such as oscilloscopes, but the need to find a way of displaying large amounts of information remained. 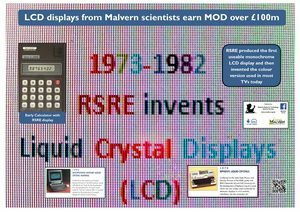 A big step forward came in 1982 when RSRE scientists Dr Colin Waters (on a BDH fellowship) and Dr Peter Raynes invented a new type of liquid crystal display, the super twisted nematic (STN) LCD. This display was different to the standard LCD in one simple, but crucial manner, the normal twist angle of 90˚ was increased to 270 ˚. The switching characteristics of the display were transformed and the standard multiplex addressing schemes now worked perfectly. 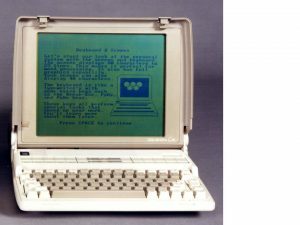 The changes required in the liquid crystal materials and the fabrication of the devices were minor, and STN LCDs showing large quantities of information soon became commercially available. The STN device was patented in 1982 and subsequently licenced by the MoD to the World’s manufacturers. It yielded royalties of over a hundred million pounds, the largest return for any MOD patent. 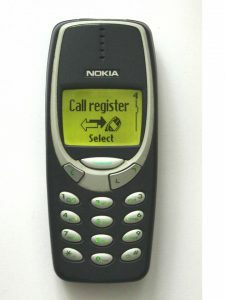 STN was the preferred display in a number of applications, including the first generations of mobile phones and laptop computers, where the availability of STN displays was a key factor in the explosive growth of these now ubiquitous technologies. An alternative addressing possibility was to fabricate an array of transistors using a semiconductor that could be deposited over the whole display surface, but none of the semiconductors that could give such a thin film transistor (TFT) had been proven to be stable. However, the Displays Group now learned of research at Dundee University on amorphous silicon (a-Si) for photovoltaic solar cells, and, following instinct rather than science, Cyril Hilsum thought a-Si might give suitable TFTs. RSRE lacked the facilities for making the device in house and he tried to persuade Dundee to collaborate. This was no easy task as Walter Spear and Peter LeComber of Dundee were heavily involved in developing their own invention of solar cells, and felt no enthusiasm for diluting their efforts. It was LeComber, without Spear’s blessing and possibly without his knowledge, who made the original a-Si TFT and supplied the first batch to Malvern where they were fabricated into LCDs. On Christmas Eve 1978, RSRE switched LCD pixels with a-Si TFTs for the very first time. 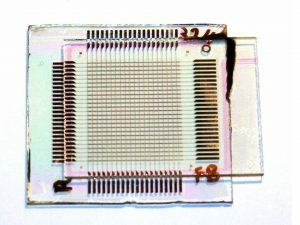 This world first breakthrough led to the use of TFT addressed LCDs in today’s TV and computer screens. Neither RSRE nor Dundee gained financially from this development because a 1962 patent already covered the TFT as a device, with a wide mention of potential semiconductors. The MoD patent experts advised that this would frustrate any attempt to patent the invention and would hinder the chance of licensing. So this discovery, which is now in use worldwide, brought no direct economic benefit to the UK, although it brought lasting credit to both Dundee and RSRE. The Malvern liquid crystal materials research gained two Queen’s Awards for Industry. This was not the end of the RSRE display story. 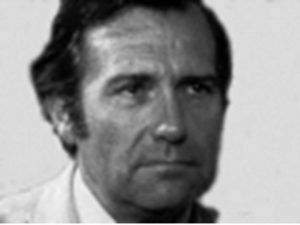 In 1995 Dr Cliff Jones, together with Dr Carl Brown and Dr Guy Bryan-Brown, invented a novel device configuration and switching mechanism known as the Zenithal Bistable Display, or ZBD. 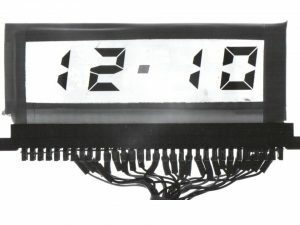 Bistable displays maintain an image long after the removal of driving signals and had long been a goal of the LCD industry. The ZBD device is truly bistable and has a very attractive appearance. In 1998 a team of five scientists was spun out into the private sector into a company called ZBD displays. By this time RSRE had become DERA, and later QinetiQ. ZBD was DERA’s first spin-out company and was awarded a £1.5 million investment by venture capital funding. 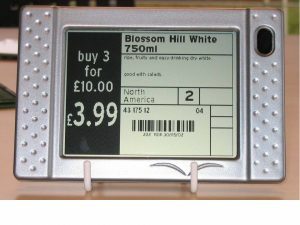 The company is now called Displaydata and is the world leading provider of graphic electronic shelf edge labels, with over $22M sales p.a.